Multi Sub Screen Designed for rapid screening of very large numbers of Clonal or PCR samples, the multiSUB Screen horizontal gel unit has a 672 maximum sample capacity per gel. This allows loading and analysis of exactly seven 96 well format micro titre plates. The large gel run length of 32cm also allows resolution of samples over a long distance for separation of complex sample bands such as in restriction fragment analysis. The unit is available with a full length tray or with other tray length options of 16 or 24cm so that the user’s exact requirements can be matched. 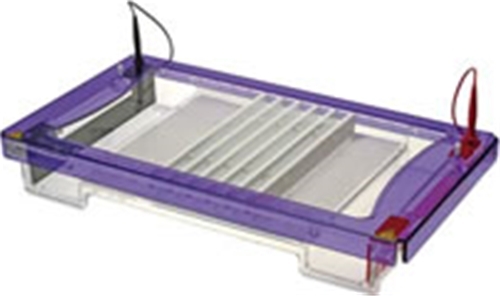 In addition to options for single length gel trays, multiSUB Screen is available with all three gel tray lengths to provide the maximum in flexibility, versatility and value. Buffer recirculation ports are included as standard to allow enhanced resolution over extended runs while loading guides enhance well visibility for easy sample loading.